Amid heightened tensions between Israel and Western allies, Jerusalem on Thursday confirmed a major annexation of 154 hectares (380 acres) of territory north of the occupied West Bank. Israel's announcement of it's largest agricultural land seizure since 2014 has drawn harsh criticism from Palestinian and Western authorities. Palestine officials announced they would push for a UN resolution decrying Israeli settlement policies. "Settlement activities are a violation of international law and run counter to the public pronouncements of the government of Israel supporting a two-state solution to the conflict," UN Secretary General Ban Ki-moon said in a statement. The move follows diplomatic clashes this week between Washington and Jerusalem, as US ambassador to Israel Dan Shapiro angered Israeli state representatives by issuing a statement that the US was concerned and perplexed by Israel's West Bank policy. "We believe they're fundamentally incompatible with a two-state solution and call into question, frankly, the Israeli government's commitment to a two-state solution," deputy State Department spokesman Mark Toner said on Wednesday. In a move certain to bite the hand that feeds, Israeli forces destroyed six housing structures in the West Bank that were part of a project funded by a humanitarian arm of the EU. The structures were intended for Bedouins living in an area between Jerusalem and the Dead Sea, locally known as E1. Israeli construction in the area would split the West Bank, cutting Palestinians off from East Jerusalem, the city they seek to make their capital. 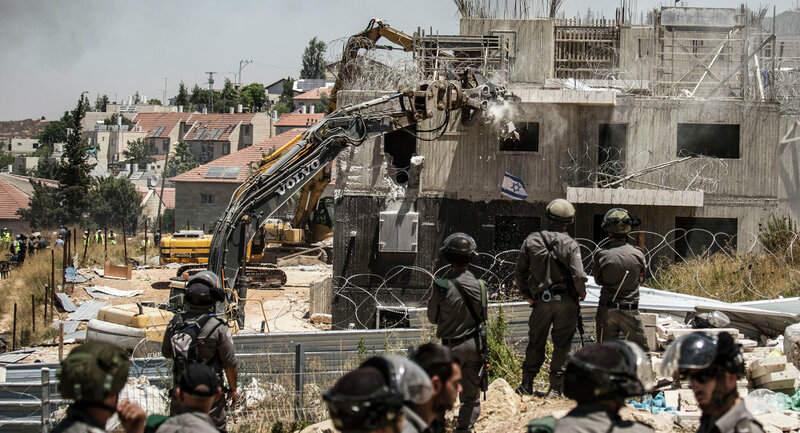 Israeli officials have not responded to global condemnation of the demolitions and incipient annexation, but Prime Minister Benjamin Netanyahu suggested last week that EU construction in the area, whether humanitarian or otherwise, was not legal. "They're building without authorization, against the accepted rules, and there's a clear attempt to create political realities," he remarked to media. To justify the seizure of land, Israel has previously used an 1858 Ottoman law stipulating that land that lies uncultivated for a specific period of time can revert to government property. Territories that Israel intends to appropriate are part of the land Palestinians claim for the recognition of their independent state in the West Bank, Gaza and East Jerusalem; areas Israel seized in the 1967 Six-Day War.